It’s spring in Japan’s ocean waters, the time of highest primary productivity, when lengthening days reawaken the hibernating marine foodweb. The satellite image above is from the area about 160 kilometers/100 miles north of the Fukushima I Nuclear Power Plant. It was shot on 21 May 2009 and shows where Japan’s two mighty ocean currents—the Kuroshio and the Oyashio—collide. The convergence zone is awesomely rich. The Oyashio flows down form the Arctic, the Kuroshio up from the subtropics. Where they meet you get all kinds of fascinating expressions of fluid dynamics—highlighted in the image above by eddies colored aquamarine by the presence of intensely blooming phytoplankton. 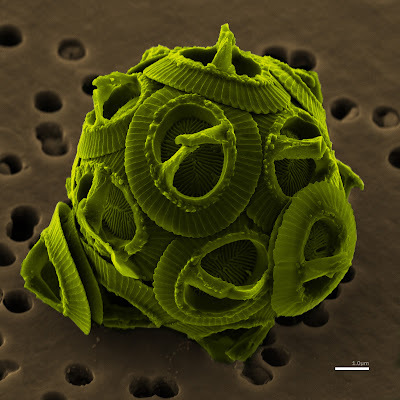 Fluid dynamics drive biological dynamics too, and the phytoplankton are busting their tiny chlorophyll guts, so to speak, feasting in the collision zone—where nutrients are getting churned up from the seafloor to deliver nature’s own signature blend of Miracle-Gro. 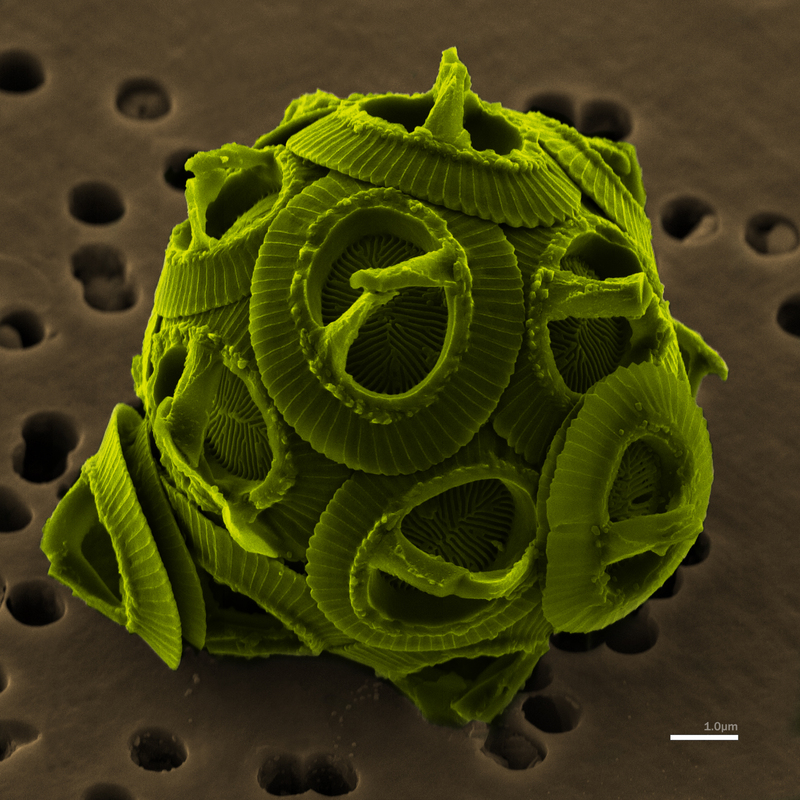 According to the engineering specs for Earth, without phytoplankton making life from nonlife, there would be little life in the ocean, perhaps none in Japan or just about anywhere else. But this year the phytoplankton that feed everything else in the sea, one or four trophic levels removed, are likely to be sporting a couple of far-out new ingredients: iodine-131 and cesium-137. 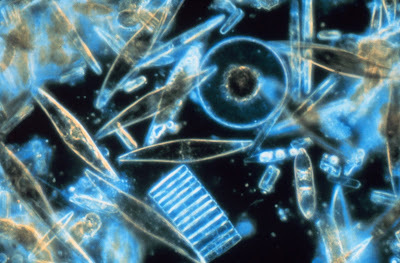 So what might hefty doses of ionizing radiation mean for phytoplankton, Japanese waters, and the world ocean? Well, the French group SIROCCO is using its 3D SIROCCO ocean circulation model to investigate the seawater dispersion of Fukushima’s radionuclides. You can read about their modeling system here. The SIROCCO group stress their disclaimers and I will too: These models are based on mathematical equations too simple to capture the dynamism and complexity of the physical and biological systems at play in the real world. Still, the models are a great starting point and are sure to get better fast. So far they suggests that the radionuclides falling from air to sea have spread ~600 kilometers/372 north-south miles along the shore, and ~150 kilometers/93 miles offshore. Dilution goes hand-in-hand with dispersion, though, and these air-deposited radionuclides are 20 to 100 times less concentrated in ocean water the farther you move from the Fukushima plant. However the radionuclides being released directly into the ocean—from TEPCO’s purposeful release of 10,000 tons of water, and from as-yet unknown leaking pathways—are acting differently. 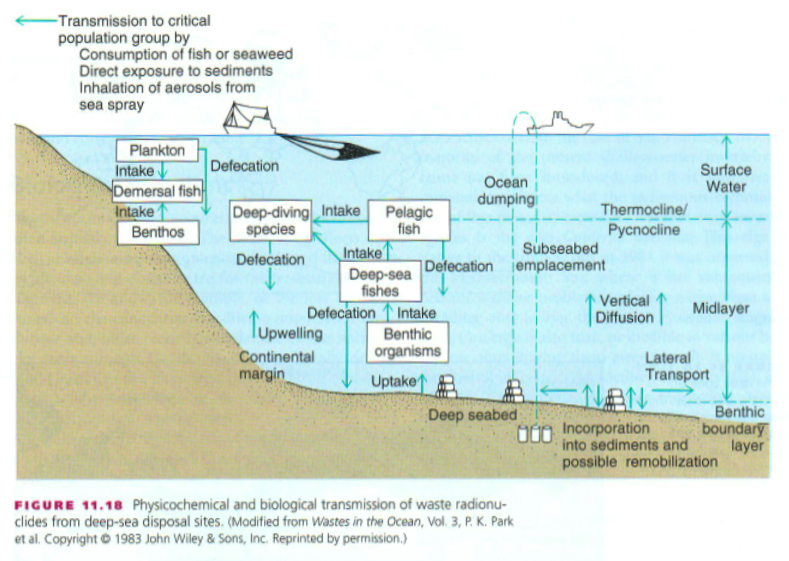 The model suggests these ocean-released radionuclides are being naturally sequestered within 50 kilometers/31 miles of the plant. But they’re also more intense—1000 times more so around Fukushima than in the air-to-sea deposits further out. 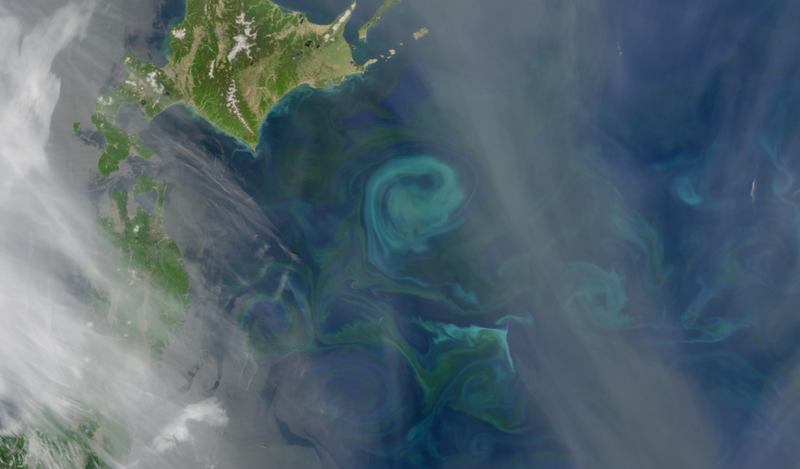 The good news is that the powerhouse of the Kuroshio Current—a humongous western boundary current like the Gulf Stream—appears to be forming a kind of firewall keeping the contamination away from Tokyo’s coast and funneling it east. You can see that dynamic in the image above. Again, animations here. 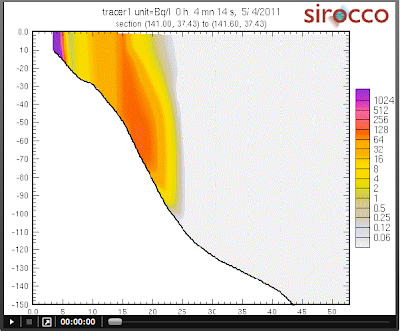 The SIROCCO model is also forecasting vertical dispersal in the ocean—an important consideration since at least some radionuclides will get incorporated into seafloor sediments and from there remobilized by living things that chomp on the seafloor. See my earlier post with a graphic showing how this works. 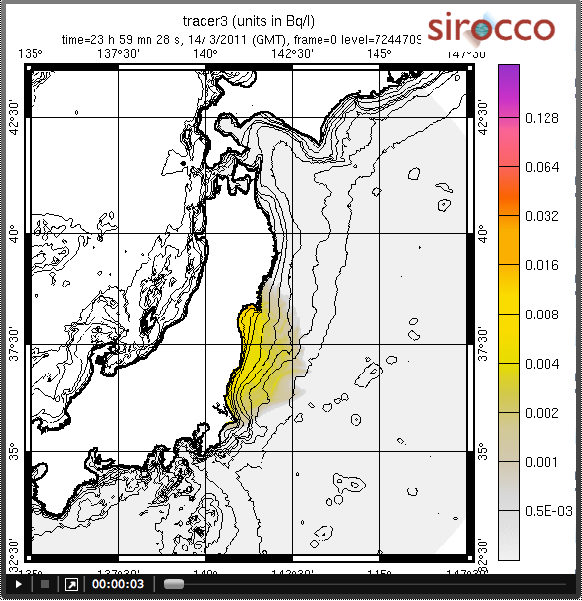 The image above forecasts possible vertical dispersion in the waters closest to the Fukushima plant for those radionuclides released directly into the sea. Animation here. Whatever pathways the Fukushima poisons take, they will certainly alter the springtime blossoming of Japan’s ocean, starting with the phytoplankton and working up the foodweb. 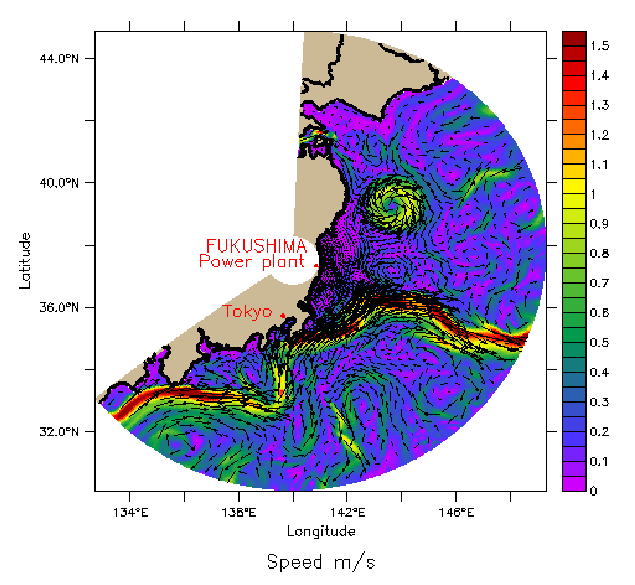 As for the effects on the rest of the world ocean, it’s a matter of how much, how far, and for how long Fukushima’s newborn radionuclides go sailing. Cross-posted from my blog Deep Blue Home.